In order to address this project, it is first necessary to investigate what is meant by structuralist analysis. Pooke and Newall (2008: 102) define structural analysis as the way semiotic theories have been used to develop the sign systems within a text or social practice. The aim being to reveal the signifying relationships, values and/or assumptions within the world they represent. Chandler (2008: 4) asserts that Saussaurian theories constituted the starting point for structuralist methodologies and that these represent an analytical method involving the application of the linguistic model to a wide range of cultural phenomena. A key point in Saussure’s conception of meaning was emphasising the difference between signs – language for him was a system of functional differences and oppositions. The concept of the relational identity of signs is the heart of structuralist theory and Saussure emphasised in particular negative, oppositional differences between signs. Concepts are not defined positively (i.e. In terms of content) but negatively (i.e. By contrast with items in the same system: “what characterises each most is being whatever the others are not.” (Chandler, 2008: 21) To illustrate this Chandler uses the example of how we might teach someone who did not share our language the meaning of the term red: the point would not be made by showing a number of red objects, however, success would be more likely showing a number of objects that are identical except for colour, thus, emphasising the red object. Syntagmatic: the horizontal axes, concerning positioning. Syntagmatic relations are possibilities of combination and refer intratextually1 to signifiers present in a text. Paradigmatic: the vertical axis, concerning substitution. Paradigmatic relations are functional contrasts and involve differentiation and refer intertextually2 to signifiers absent from the text. Chandler (2008: 85-6) defines syntagm as the orderly combination of interacting signifiers which form a meaningful form within a text – sometimes called a ‘chain.’ They are made within syntactic rules and conventions, for example, a sentence is a syntagm of words (also – paragraphs, chapters.) The ways which various elements within a text may be related to each (syntagmatic relations) are created by linking signifiers from paradigm sets. These are chosen based on whether they are conventionally regarded as appropriate, for example grammar. Crow (2010: 39) describes syntagm as a collection of signs organised in a linear sequence. For example, a sentence: words are arranged in a syntagmatic sequence, each sign having a syntagmatic relationship with the sign before and after, the value of the sign being affected by the other signs around it. A visual example could be clothing: a syntagm made up of individual garments whose value is affected by combination with other signs, these combinations are governed by convention for dressing ourselves which could be termed taste. Chandler (2008: 87) states that paradigmatic analysis seeks to identify pre-existing signifiers which underlie a texts content. This involves consideration of the positive/negative connotations of each signifier, which is revealed through the use of one over another. This is referred to as ‘binary oppositions’, an example would be public/private. For Crow, (2010: 40) paradigms have two basic characteristics: the units of the set have something in common and each unit in the set is obviously different from the rest. Meaning does not come from linear signification alone, when making combinations of signs we are faced with a series of individual choices where one can be substituted for another in the same set. For example – letters of the alphabet. We understand letters as paradigms of the same set, the choices of combinations made create words which in turn can become other sets of paradigms such as nouns and verbs. Changing combinations can also completely change meaning. This direction of thought can seemingly be extended indefinitely: the way language is used can create further paradigms such as jargon or rhyming words in poetry can be described as paradigms based on sound. Barthes analysed the syntagmatic and paradigmatic implications of clothing in ‘The Fashion System.’ The paradigm was items which could not be worn at the same time on the same part of the body while the syntagm represented how these different elements came together to form an ensemble. 1 intratextually: relates to internal relations within a text. 2 intertextually: refers to links in form and content which binds a text to other texts. Find two examples of naturalistic paintings of a particular genre – landscape, portraiture or whatever – and annotate them to discover the similar conventions of representation: medium, format, allusion, purpose, etc. Naturalism is defined as “an attempt to create life-like representations of people and objects in the world by close observation and detailed study.” (Pooke and Newall, 2008: 224) In my research I found that naturalism as an art movement was not easily defined with examples being given across the ages. The artists for the two pictures I have chosen are both contemporaries of the Barbizon school of early 19th century French artists who were concerned with minutely observing natural settings and actively rejected the conventions of academic art in their choice of subject matter. Seemingly depict everyday activities of rural workers. No eye contact, in fact The Stone Breakers in Courbet’s picture are facing away. This gives the figures in each painting an everyman feeling, the pictures are about the activities that are being engaged in rather than abou individuals. Subject matter – everyday working activities not usually depicted in paintings. The protagonists are common people – not the traditional subjects of oil paintings. The pictures are situated outside. Non idealised representations, the depictions are distinctly unromantic. The labour depicted seems to be difficult although the protagonists of both paintings seem committed and focused on the tasks they are engaged in. The figures in both paintings are clearly the subjects rather than to add interest to the landscape. Both paintings invest a certain nobility to the figures depicted and the tasks they are engaged with – they have an air of quiet dignity. Find two examples of portrait photography, one formal and one informal, and annotate them to see what conventions from the formal are observed in the informal and give your thoughts on why this might be so. For this part of the project I have chosen two photographs from the series ‘Marine Wedding’ by American photographer Nina Berman and represent the informal and formal sides of wedding photography. Picture one (here) is a portrait of a man and a woman. The clothing they wear suggests that they are a newly married couple: the woman is wearing a white wedding dress and veil and holds a red bouquet of roses – clearly she is the bride. She is young and beautiful, there has been a great deal of care taken in her appearance from the way her hair is styled to a detail like the necklace she is wearing which seems specifically chosen for the occasion and to compliment the rest of her clothing. Her skin is tanned which may be her natural colouring but could also have been accentuated by visits to tanning salons in the lead up to wedding which shows the weeks of preparation that have gone in to her looking her very best for her wedding day. The man is in military uniform so it is not immediately clear if he is the groom or a relative of the bride, for example brother or even father. It can be assumed he is the groom however based on the convention of servicemen wearing their forces uniforms to get married. The red piping of the uniform also matches the red detail of the brides dress and the wedding bouquet, it is also a convention for elements and colours used in the bride and grooms clothing to be repeated in other aspects of the entire wedding design. The man appears to have been severely burned and is disfigured – it is difficult to ascertain his expression and even age because of this. 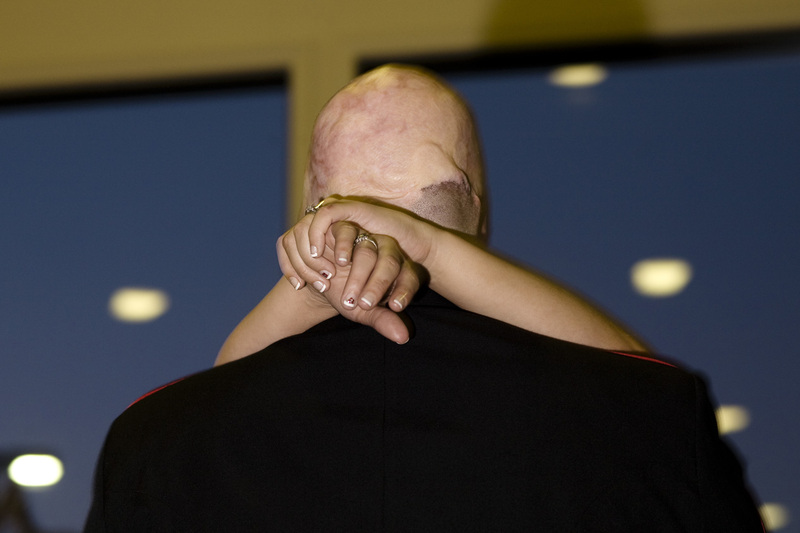 Combined with the uniform it would be logical to think that he has suffered these injuries in service, the medals her wears would also indicate that he has seen active duty. It is impossible to tell if he has any other injuries but he seems to be standing in a slightly awkward and rigid way which would suggest he has further ailments we cannot see – the facial burns are to such a degree that it seems unlikely the injuries would be confined to his face alone. Formal portraits of two people at a wedding are normally reserved for the bride and groom so it would seem logical to assume this is what we are looking at, it is possible that the man could be a relative or even friend of the bride but seems unlikely – if this was the brides brother for example you would expect to see someone else in the picture as well, such as a partner or other family members. The other main clues that this is a formal wedding photograph are the posing which is deliberate and rigid which suggests the couple have been closely directed to pose in this way, their rigidity also suggests they are uncomfortable and maybe even self conscious to be standing this way. Neither faces the camera but look to the side out of frame, if this was a natural portrait we would expect the sitters to be looking straight at the lens, and by extension the viewer of the photograph, but this does not happen here. The dappled background is clearly one used by professional photographers and the lighting, although subtle, appears to be artificial and the photograph looks like it has been shot indoors which would indicate a professional photographer using studio lighting has taken the shot. The expressions that the couple have on their faces prove problematic to our reading of the photograph – the bride seems serious, even solemn, and it is impossible to read any information from the groom because of his disfigurement. A simple explanation of the brides expression could be that she is nervous, being put centre stage at a wedding as the bride is daunting. Being closely directed on how to pose by the photographer, as it appears she has been here, does not lead to a relaxed posture – perhaps she is concentrating on maintaining the pose so the image required by the photographer can be captured. On another level however, the bride could be mirroring her groom – he is unable to show expression due to his facial injuries and it would seem natural that as his bride she would be acutely aware of this and would subconsciously appear this way herself. Another reading could be that the bride is not enjoying the event and possibly even regretting being married. She appears very young and we are left to wonder about the possible circumstances of the wedding. How long have the couple been together? They could either be childhood sweethearts or have been together for a much shorter length of time. Either way, the bride must have felt a sense of duty to go through with the wedding. If the wedding was planned before the event that has led to the grooms injuries then she would feel duty bound to go through with it out of both pity for her partner and fear of how not doing so would appear. Likewise, if the wedding was planned following the grooms injury she would feel similarly duty bound to go through with it. The figure in the foreground is a man: he is taller than the figure behind, he wears a formal jacket which is traditionally male attire, his head is bald. The figure in the background is a woman: her nails are long and neatly manicured with small red jewel details stuck onto two of them, her arms are bare – although we cannot see what she is wearing this suggests she is wearing some sort of dress, she is wearing a number of rings which are of a feminine style – men are more likely to wear fewer rings and they would be of a plain design. Once we arrive at the conclusion that we are looking at a picture of a man and woman we can begin to explore both their relationship and the activity they are engaged in – this also adds weight to our initial reading of gender. The couple appear to be dancing, the arms of the woman around the man’s neck is the conventional way couples slow dance together, the closeness of their bodies combined with this reading would suggest they are a couple. There is slight motion blur in the photograph which suggests they are moving (dancing) rather than stood still in an embrace. The conclusion that this is a photograph of a couple who are romantically engaged dancing together leads to the conclusion that this is a picture of their first dance at their wedding. A number of clues lead to this: we have already noticed that the man is wearing a formal jacket and that the woman has taken care of her appearance by having her nails carefully manicured. The small, red jewels on two of her nails match the red piping that is just visible in the man’s suit – it is conventional for the clothing worn at weddings to have a unified theme. The bare arms of the woman suggest she is wearing a formal dress, probably a wedding dress. Although the woman has a number of rings on her fingers, the left hand is the closest to us and we notice she is wearing a wedding ring – although this could be unconscious this seems significant – our attention is being drawn towards the ring – in fact, it is the closest point to the camera lens. And finally there is the cultural knowledge of the significance of a couple’s first dance at their wedding combined with the fact that it is perhaps the only time that it would be appropriate to photograph a couple dancing. The two images here are from the same series ‘Marine Wedding’ by Nina Berman, the knowledge of this changes our reading of each image significantly. Separately and with no other knowledge, I believe the preferred reading of each image is of a couple on their wedding day. Clearly photograph one is the more obvious to read of the two, however, the relationship between the couple is not completely explicit and requires assumptions to be made. Photograph two requires more work for us to arrive at the reading that what we are viewing is a couple having their first dance on their wedding day, although more implicit I believe close reading makes this as evident as photograph one. Both pictures are linked by the need to understand the cultural conventions being displayed. Taken together, the pictures represent the narrative of the couples special day – the formal, posed, studio lit picture one and the candid picture two which although unposed is as unnatural as the first. The knowledge that these pictures are part of a larger series by photo-journalist Nina Berman which has the intent of showing how injured American serviceman adjust to life when returning from war changes our reading significantly. Picture one becomes a pastiche of the wedding photographer’s style with picture two representing the documentary mode of the photographer. It could be argued that wedding photography is a form of documentary in itself representing a factual record of the couples day, the unusual angle of picture two gains more gravitas – this is no longer a ‘grab shot’ but an image taken, and selected, by a professional photo-journalist which suggests there was intent involved. I initially thought that this would be a quick project to complete as there are no readings involved. I soon found more to try and understand than I first bargained for, although I do think I have gone some way to put a boundary on my research as I will detail below. I quickly found that naturalism is an artistic style that has many varying interpretations over history and is also used as a synonym for realism although this is perhaps not the best definition. I was very much in danger of falling down the rabbit hole at this point and get carried away with researching naturalism and become preoccupied with this rather than concentrating on what the project was asking for. Writing about each of the images I undoubtedly felt more comfortable with the photographs – as this is the form I am most interested in this is hardly surprising. It is of note however that I found the photograph much easier to identify with as a representation of reality rather than the paintings. Clearly the fact that these are not contemporary works is also a factor – my knowledge and comfort at being able to discuss art rather than photographs is something for me to consider and work on.